Posted 30 March 2017 at 8:06 am. GET TO KNOW THE MCO! 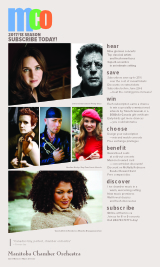 Subscriptions are still the best way to save money on MCO concerts, and require a comparatively small commitment. As long as you purchase at least six tickets — to however many different shows, and for however many people — you’ll get a 20% discount on all your tickets, a free CD, a Musicnet Subscriber Reward Card, and ticket exchange privileges just like any subscriber. Click the links or get an order form below, then select from the following concerts. Get a six- or nine-concert package now, and mix and match at will! Casual tickets will be available here and at our usual outlets 28 July 2017. Winnipeg audiences have a special appreciation for cello, and Ariel Barnes is, in the words of Bramwell Tovey, “the outstanding Canadian cellist of his generation”. Barnes is back with the MCO by popular demand to perform works by Joseph Haydn and Michael Oesterle; other works by Wolfgang Amadeus Mozart and Jeffrey Ryan. Two of Canada’s foremost baroque string players — one concert. Violinist Aisslin Nosky and violist Max Mandel will take turns play-conducting a famous concerto, before joining one another in a performance of Mozart’s Sinfonia Concertante for violin and viola. An exceptional collaboration. Other works by Haydn, Telemann and Michael Oesterle. It’s an exciting event whenever the choral music of Arvo Pärt is performed. This performance of Pärt’s Te Deum is made all the more special because it’s The Winnipeg Singers and the MCO’s 45th anniversary seasons. Yuri Klaz conducts Canada’s renowned choral ensemble and the MCO. Additional works by Eleanor Daley and Ola Gjeilo. Guy Few is not only an outrageously gifted musician, he’s also a consummate showman. At this concert, the trumpeter will bedazzle us with performances of Bach’s second Brandenburg concerto and music by Neruda. Alexander Weimann will lead from the harpsichord. Additional works by Johann Baptist Georg Neruda, Arcangelo Corelli, GF Handel, David Scott and Vivian Fung. One almost feels regal music should accompany the announcement itself: the MCO will be performing the Canadian premiere of a new work by the doyen of post-60s classical music, Philip Glass! Pianist Simone Dinnerstein , famous for interpretations of Bach, performs the commissioned work in a concert that also, naturally, includes music by dear old Johann Sebastian. Marc-André Hamelin is one of the greatest living pianists; an artist whose hands critics playfully call one of the musical wonders of the world. In this concert those hands will bring their magic to bear on Liszt’s Benédiction and Debussy’s Images. Cadeau divin! Additional works by Claude Debussy, Samuil Feinberg and Leopold Godowsky. Sopranos Tracy Dahl and Andriana Chuchman have a special relationship with Winnipeg. They’re both high-flying, international opera singers with roots in Peg City. They have another unique connection — Andriana is Tracy’s former pupil. At this concert, the pair will perform classic duos and arias. Also on the programme: Airs d’Espagne by José Evangelista. At the MCO, we can’t help but feel sorry for anyone who missed Lucie Horsch’s performance with us in 2016. You may never see another teenager — or recorder player — as musically gifted as her. Hear her perform the music of Bach and Vivaldi in true baroque style. Other works by Giovanni Battista Sammartini, WA Mozart and Dag Wiren. As one of Canada’s most celebrated — and most glamorous — divas, soprano Measha Brueggergosman will need no introduction. An astoundingly eclectic interpreter with a special gift for post-romantic repertoire, Measha will perform Mahler’s almost decadently rich Lieder eines Fahrenden Gessellen. Other works by Heidi Ouellette, Vasily Kalinnikov, Joaquín Turina and Pyotr Ilyich Tchaikovsky. MCO’s 2018/19 season is sponsored by CN. Season media sponsors / Winnipeg Free Press, Canstar Community News, Classic 107 and Golden West Radio. View a video message from MCO season media sponsor Prairie Public Broadcasting . Heartstrings sponsor: Christianson Wealth Advisors, National Bank Financial. Education sponsors: Great-West Life. Pizzicato Pizza Club sponsor: New Flyer Industries Ltd.
Music for all! Program: Sun Life Financial. Translation services sponsor: Parenty Reitmeier. Season Aeroplan travel sponsor: Gerald R. Brown.